There are many explanations for sluggish cash performance and obviously, understanding causes may be useful in preventing recurrence. Meantime, you have a backlog and the objective is to get caught up. That’s where a Cash Acceleration Team can be helpful. What is a Cash Acceleration Team? It is a highly customized temporary external resource allocation of seasoned professionals with the right credentials, experience, and skillset to help you get current on your collections and stay there. A team might include Coders, AR Specialists, Billers, Collectors, and Auditors, among others. The size of the team depends mostly on volume, the scope of work and how quickly the organization wants to capture an expressed opportunity but other factors may come into play as the team is customized and designed. Team resources can work remotely or at your facility or some combination. Successful teams are closely managed and can redirect focus as project demand dictates. Nearterm can work with you to build just the right team. 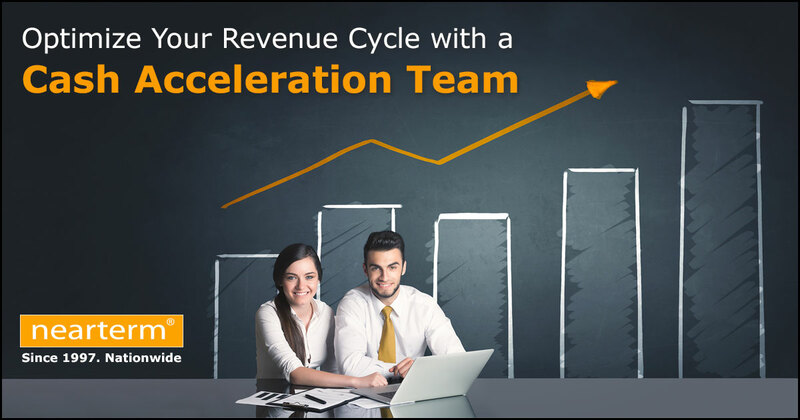 We’re experts in Revenue Cycle Management (RCM) and our Cash Acceleration Teams are a proven solution for helping your facility achieve its cash collection targets faster and with less effort.